Better late than never. 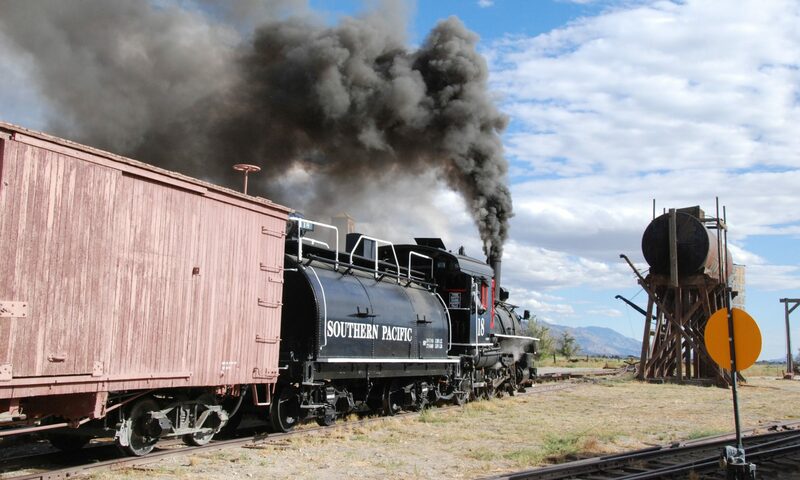 Over the weekend of November 21st and 22nd we gathered in Independence to continue the restoration of SP #18. On this weekend we continued the tedious work on the plumbing and various other detail work. Lots of little things left to do, but all the little things add up. New air res and cooling pipes. 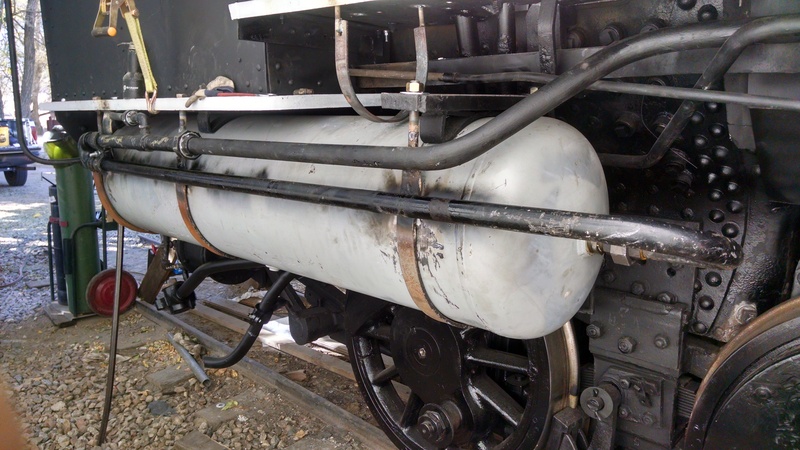 We reinstalled large sections of the air lines, like the cooling pipes on the sides of the air reservoir tanks. 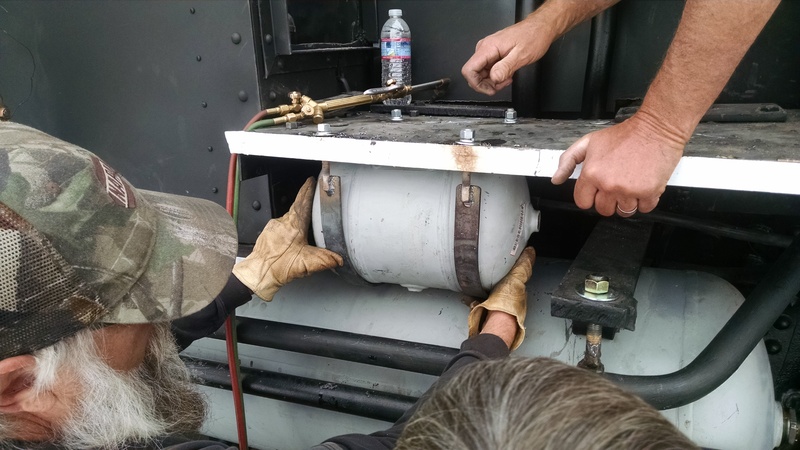 The new air equalizer tank was also bolted on under the engineer side running board and new straps to hold it on had to be fabricated. Several fittings all over the engine got anti-seize added and tightened up. While this was going on work was continuing in the cab. 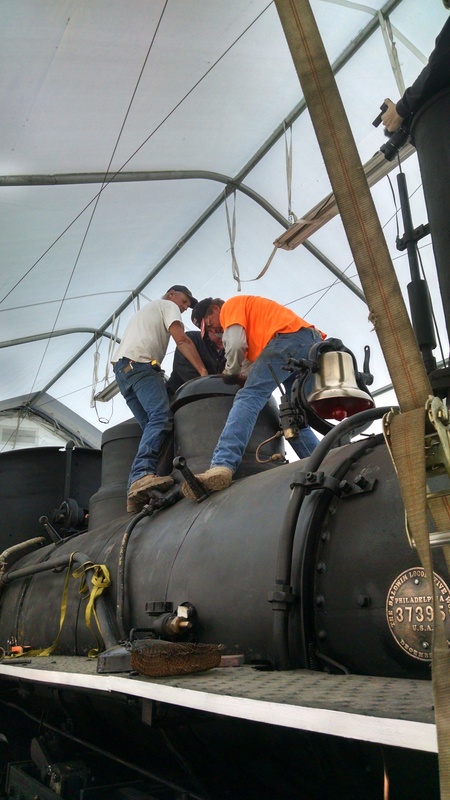 At the last work session the new boiler jacketing was installed in the cab. With that done we reinstalled the water glasses, hydrostatic lubricator, and a few other pieces of plumbing, hopefully for the last time. Test fitting the equalizer tank. 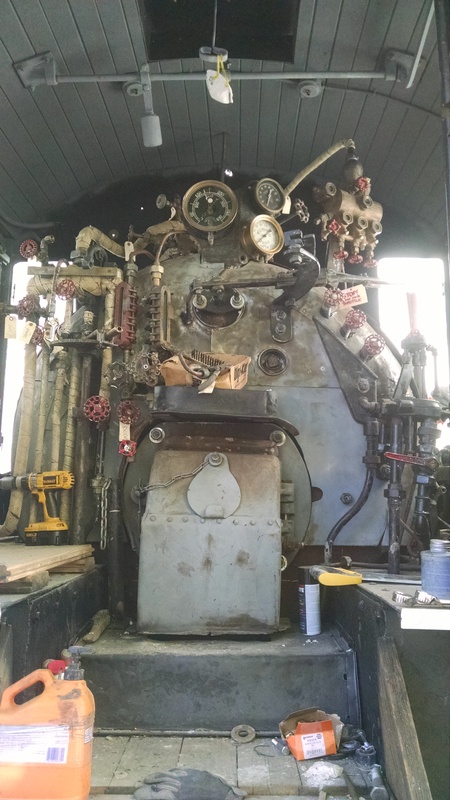 Other small but important tasks completed included installing the wood flooring on the firemans side of the cab, measurements were taken for spiral wound gaskets for injectors and water glasses, the headlight was bolted on, and the sand dome was assembled and the top cover was added. Cab interior with much of the plumbing installed. Also note the wood floor on the left. Forest, Brian and Marty set the sand dome top in place. One very critical job was measuring the center to center lengths on the drivers, then finding the center of the piston stroke and the extreme ends of stroke. It was discovered before we removed the drivers in 2012 that they were spaced differently than the SP spec sheet called for. The reason for this was not known at the time, and when we reinstalled the drivers we trammed them according to the spec sheet. However in October while working on the rod brass we discovered that both of the main rods are 1/4″ shorter than originally called for. Because of the available material on the small end of the rods, this difference in rod lengths is to significant to safely make up by offsetting the rod brass and holes. We could make new main rods, expensive, so instead we will make accommodations just like the SP did, by moving the drivers forward in the frame 1/4″. She looks really good with her headlight back on and some new paint.